This is an introductory adventure for those playing Castles & Crusades. 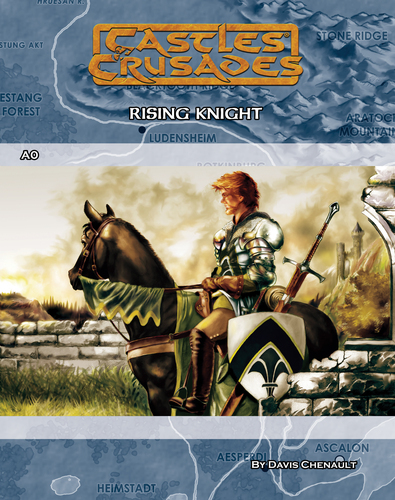 The module has been designed to allow for the players and Castle Keeper alike to begin using the Castle & Crusades rules in a fairly non-demanding game setting. The goal is to familiarize the Castle Keeper and players with the basic rules and their applications while undertaking an exciting adventure. The adventure is also designed for modularity and expansion. Many of the encounters, monsters, settings and non-player characters can be removed from the context of this adventure and placed within those of your own making. We here at Troll Lord Games encourage all gamers to do so, as this is the quickest route to ever more fulfilling game-play. As with the Castles & Crusades rules, this module is a tool to use as you will. Please do so. Further, should the players or Castle Keeper care to continue with the adventure and follow its thematic development, the follow-on modules, Assault on Blacktooth Ridge and The Slag Heap are now available. Several references and avenues for continuing the adventure are mentioned within the text, but the Castle Keeper must devise the most meaningful manner in which to carry this out. This book is also available in the Castles & Crusades Collector's Box Set complete with a players manual, a monsters and treasure manual, and classic dice! From the makers of the Castles & Crusades role playing game comes the introductory adventure that started it all!